For the opening of the Sine Institute of Policy & Politics, AU president Sylvia Burwell talked with Sen. Bob Corker in the Newseum. American University’s Sine Institute of Policy & Politics opened with a stimulating discussion between AU president Sylvia Burwell and Sen. Bob Corker (R-Tenn.). On Tuesday, September 25, Washington, DC, business, nonprofit, and government professionals, AU trustees, alumni, senior leadership, faculty, and students gathered in the Knight Conference Center at the Newseum. The themes of the day—and the mission of the new institute—were bipartisan solutions, unity, and confronting the nation’s pressing challenges. The Sine Institute of Policy & Politics was made possible with a milestone $10 million gift from AU alumnus and trustee Jeff Sine, SIS/BA ’76, and Samira Sine, an accomplished journalist and advocate for women and children. She later exalted Kennedy’s words at AU’s historic 1963 commencement. “A young President Kennedy observed on our Jacobs Field, ‘Our problems are manmade. Therefore, they can be solved by man.’ American University is a place for problem solvers; a community of changemakers; and a campus where no one is indifferent,” Burwell said. Burwell and Corker first worked together when Burwell was Office of Management and Budget director, and then later as Secretary of Health and Human Services under President Obama. In her first question, Burwell asked Corker about US fiscal health and economic productivity. While the economy has improved since the recession, he said, there’s a need to focus on the bottom 60 percent of workers in the country. “Sometimes we only look at GDP growth at large, we look at where the markets are. But I think we probably haven’t done a good job looking through the entire socioeconomic spectrum and how everyone is doing,” he said. Corker expressed disappointment over government spending and deficits. As a senator, he worked on issues surrounding the 2008 financial crisis, and he assumed Congress would subsequently move toward solving fiscal problems. “I was very optimistic about it. I’m now in a place where I feel like, unfortunately, it’s probably going to take a crisis for us to do that,” he explained. He suggested Social Security reform should be on the table, and he implied that both parties could get on board. “Things only happen like this under divided government, because no party wants to own changing Social Security or changing Medicare,” he said. 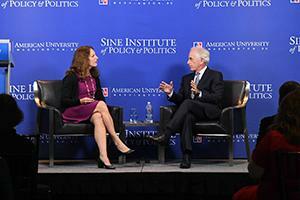 On September 25, the Sine Institute held its inaugural event: a conversation between American University President Sylvia Burwell and Senator Bob Corker (R-Tenn.). She asked Corker what he’d tell AU students interested in improving discourse and collaborative policymaking. Based on his early experiences in the Senate, he advised—in a very AU Wonk-style answer—mastering specific issues. “If you really focus on just a few areas, and you know more about something than anyone else, it’s amazing how people will come to listen,” he said. When Burwell questioned what policies will motivate voters in the congressional midterms, Corker did not mince words. Candidates are ignoring challenges like technology and the workplace or the United States’ role in the world, he argued. In a lively exchange, Burwell countered that health care has been a salient campaign issue, and she offered a compelling reason why. During an audience question-and-answer session, School of Public Affairs professor David Barker asked Corker where he saw the GOP heading in the next 20 years. He opined that his party will address fiscal issues, support free trade and competitiveness, favor legal immigration, and—perhaps showing political heterodoxy—strengthen the institutions of government.